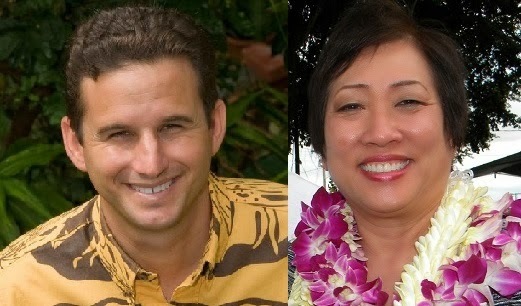 For Democratic rivals Brian Schatz and Colleen Hanabusa, politics is all about relationships. Schatz says he’s been surprised at how many friends he’s made as a freshman U.S. senator. Hanabusa says her time in state government before getting to the U.S. House shows how she’s earned respect and confidence of peers. And Hawaii needs those relationships, both candidates said during their first debate Tuesday night on Kauai. Schatz and Hanabusa are vying to fill the final two years of deceased U.S. Sen. Daniel Inouye’s term through 2016. Associated Press. After circling each other for more than a year, U.S. Sen. Brian Schatz and U.S. Rep. Colleen Hana­busa met Tuesday evening in their first debate in the Demo­­cratic primary, a detailed dialogue on federal policy that revealed fissures between the Democrats on veterans affairs, early childhood education and genetically modified organisms. Star-Advertiser. U.S. Senate candidates Brian Schatz and Colleen Hanabusa went toe-to-toe here Tuesday night in the first of five scheduled joint appearances. For all the talk of the intensity of the race, the Kauai forum was rather relaxed and less an exchange of differences than it was a contrast in styles and philosophies. Civil Beat. Two Democrats walked into the Lihue Convention Hall on Tuesday and made their way to the front of the room, where a table on an elevated stage waited for them. By all accounts, both candidates, Senate Incumbent Brian Schatz and U.S. Rep. Colleen Hanabusa, came from humble family backgrounds and had distinguished track records in state and federal offices — accomplishments that either contender could attest to. But the difference between them, Hanabusa contended, "is in our values and our perspectives, and our perspectives are shaped by a lifetime of experience and hard work. "Garden Island. Five candidates for Hawaii's 1st Congressional District seat tried to distinguish themselves from each other on support for the tourism, military and construction industries at a forum at the Japa­nese Cultural Center of Hawaii on Tuesday night. Star-Advertiser. Candidates hoping to represent Hawaii in the U.S. House are sharing their positions on military intervention, veterans care and improving Hawaii's economy. Five candidates running for the seat said in a Tuesday forum that they would not support military intervention in Iraq. Associated Press. The U.S. Department of the Interior is holding meetings around Hawai’i, asking how the federal government should be involved in creating a Hawaiian nation. Should the interior secretary propose establishing a government to government relationship with Hawaiians and help set it up? Or should the DOI leave it to the state, with possible federal requirements? Some who have been studying the issue say, neither. Hawaii Public Radio. The Hawaii Department of Education is looking to adopt a new model for social studies classes that goes beyond tests and textbooks and aims to teach students how to be problem solvers and active citizens in their communities. Civil Beat. A Honolulu homeless shelter won't take action against a mother who is refusing to cover up while breast-feeding or use a private room, its executive director said Tuesday. Associated Press. The maze of Hawaii’s homeless services is such a mess that a state initiative to provide housing for 100 chronically homeless individuals stalled at 16. Homeless czar Colin Kippen, aided by members of Hawaii’s Interagency Council on Homelessness, essentially started from scratch last year to develop a new system for driving down the state’s homeless rate, which ranks second in the nation. Civil Beat. Hawai'i has the second highest rate of homelessness in the nation, but the state has a plan to end what officials are calling an epidemic in a quick, strategic way by identifying what people’s needs are and matching them to resources that can help. Hawaii News Now. Absentee ballot applications will be sent out to Windward Oahu voters who used to cast early walk-in ballots at Pali Golf Course. Citing money and manpower issues, the city decided not to operate an early walk-in voting site in Windward Oahu – a site that was used by nearly 5,000 voters. KITV4. The Waikiki Landing, a controversial public-private partnership to develop a commercial and boating-services complex at the Ala Wai Small Boat Harbor, has lost its major funder, leaving developers scrambling to find 11th-hour financing to meet contract obligations. Star-Advertiser. Waipahu Public Library will temporarily close to replace its air-conditioning system, Hawaii State Public Library officials said. Star-Advertiser. Halau Lokahi Public Charter School has a new lease on life after its governing board and director Laara Allbrett agreed to resign as required by a new contract with the state Charter School Commission. Star-Advertiser. Gov. Neil Abercrombie said Tuesday morning he hopes to see Hawaii Island residents end the debate and embrace geothermal energy as an important resource for the state’s future energy needs. Tribune-Herald. Gov. Neil Abercrombie called the reopening of Kulani Correctional Facility “an opportunity to reclaim lives.” The 280-acre facility about 20 miles southeast of Hilo was closed in 2009 as a cost-cutting measure by former Gov. Linda Lingle. Until recently, the facility was used by the Hawaii National Guard Youth ChalleNGe Academy. Tribune-Herald. Before Tuesday’s grand reopening of the Kulani Correctional Facility, Big Island legislators and community members gathered at the Hilo Yacht Club to witness Gov. Neil Abercrombie sign five new bills approved by legislators this session. Tribune-Herald. An irritated Mayor Billy Kenoi took Kohala Councilwoman Margaret Wille to the mat Tuesday, publicly chastising her for questioning his bid solicitation for a waste reduction facility. West Hawaii Today. Hawaii’s Intermediate Court of Appeals has upheld a 3rd Circuit Court judge’s ruling that a Heeia Bay church property project was not exempt from some permitting regulations. West Hawaii Today. More than 600 jobs and millions of tax dollars could be lost if a moratorium on the cultivation of genetically engineered organisms passes, two Maui County seed companies say. Associated Press. Upward of 500 jobs and millions of tax dollars could be lost if a ballot initiative to place a moratorium on the cultivation of genetically engineered organisms either passes the Maui County Council or is ratified by voters in the Nov. 4 general election, officials of two Maui County seed companies said. Maui News. Officials from the U.S. Environmental Protection Agency told members of a Maui County Council committee reviewing a voter-initiated anti-genetically modified organism measure Tuesday that they have not heard of any health issues related to eating genetically engineered rainbow papaya, developed on the Big Island to combat a commercially devastating virus. Maui News. During election years, the Kihei Community Association (KCA) serves as a forum where voters have the opportunity to meet candidates up close. At the Tuesday, June 17, meeting, state Sen. Roz Baker, state Rep. Kaniela Ing and Maui County Councilmember Don Couch spoke about their track records. Maui Weekly. The Maui Department of Water Supply has updated its Water Meter Priority List for Upcountry Maui. The list, dated June 30, 2014, is 35 pages long and includes 1,852 requests dating back to Jan. 4, 1999. Maui Now. The Westin Maui Resort & Spa has filed a Draft Environmental Assessment for site improvements at their Kāʻanapali property in West Maui. Maui Now. Saedene Ota, who officially becomes a University of Hawaii regent emeritus today, said Monday that her decision to resign a year early from her Maui County seat last week was to prevent disclosure of her latest financial statements currently on file with the Hawaii State Ethics Commission. Maui News. Defiant and emotional testimony dominated yet another Department of Interior meeting Tuesday night as federal officials continued to gather opinions about whether the United States should pursue a formal relationship with a potential Native Hawaiian government. As it did the night before in Waimea, the meeting featured passionate testimony connected to the grievances that have festered in the Hawaiian community since the 1893 overthrow of the monarchy. Star-Advertiser. Tuesday brought to a close a pair of public meetings on Kauai to discuss whether the U.S. Department of the Interior should re-establish a government-to-government relationship with Native Hawaiians. Much like the meeting Monday in Waimea, the majority of those who spoke before press time at Kapaa Elementary School voiced similar opposition to the idea. Garden Island. A former County of Kauai employee is suing the county for wrongful termination, claiming she lost her job for following state and federal rules. Christina Pilkington worked as Americans with Disabilities Act coordinator for the county from 1999 until June 30, 2012. The suit, filed June 25, says she lost her job and was berated by Office of Mayor administration because she adhered to ADA guidelines that cost money to comply with. Garden Island. An electric utility in Hawaii is experimenting with using lasers to protect migrating seabirds. The Kauai Island Utility Cooperative said Tuesday it's attaching 30 lasers to transmission poles. The lasers will shine beams across six spans next to coffee fields. Hawaii News Now. A mysterious substance is appearing at beaches across Hawaii. It even caught state health officials by surprise. They say the brown substance seen on the shoreline on Kauai is a Trichodesmium algae bloom. KHON2.